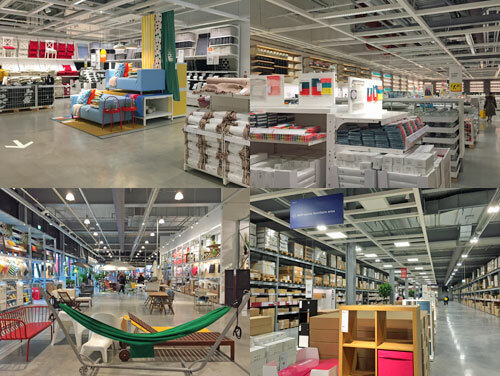 IKEA don't build big blue sheds in London very often. Their new store in Greenwich is only their fourth, and their first in inner London. It also claims to be the chain's most sustainable store yet, but only if you ignore the award-winning eco-Sainsbury's they knocked down to make way for it. 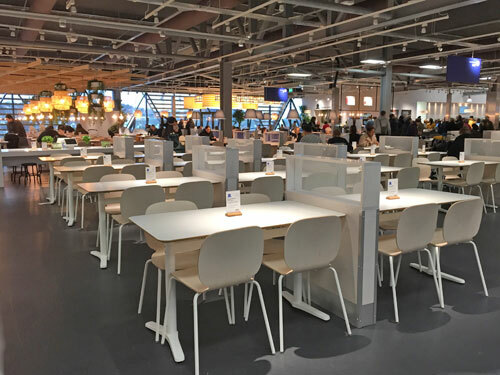 IKEA Greenwich threw open its doors on Thursday as the cornerstone of the Millennium Leisure Park, conveniently located off the Blackwall Tunnel Approach beside an enormous car park. Traffic jams are expected to be severe. I caught the bus. 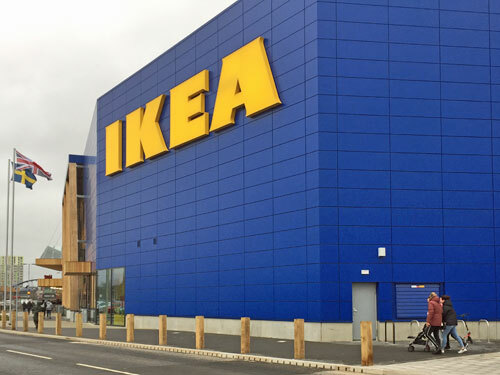 It's an IKEA so you know what to expect - a long walk with furniture and meatballs. The foyer is vast, with a bistro and a Swedish food store as diversions, plus free toilets if you're ever in the area and desperate. Only at IKEA is a hotdog 50p, and the deluxe version 20p extra. Escalators rise past recesses filled with yellow chairs and other products masquerading as art, and then you're into the retail labyrinth. Grab a bag to fill with impulse buys, and brace yourself for a series of perfect rooms you'll never match at home. All the usuals are here: bedroom clusters, intermittent crockery, loose stools, mattresses for practising on, Billy bookcases, free pencils. One section I hadn't seen before was Workspaces, entrepreneur-focused with cubicles kitted out as florists, barbers and coffee shops. The real cafe comes up next. 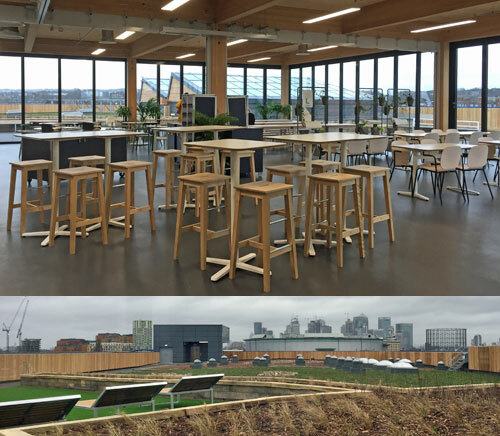 The cafe is enormous, and already enormously popular, as if the populace of SE10 have been missing somewhere cheap to gather together and eat bacon rolls, cinnamon buns and lingonberries. It reminded me of a department store cafeteria from 20 years ago, if considerably more streamlined, and at similar prices. You can learn a bit about Swedish geography on the walls, assuming you can battle past the pushchairs, trolleys and handbags. When it's really busy an additional space should be available one floor up in the rooftop pavilion. IKEA plan to rent this out for free to community groups, should you be in need of somewhere to gather for bikram yoga, plus there'll be roof gardens to wander out onto (as yet not quite finished, come back at the end of the month). Refreshed, or not, the designated route beckons onwards into the Market Hall. Here's where you may be tempted by dozens of items smarter than those you have at home already, from little baskets to lampshades to primary-coloured cushions, not that anything needs replacing but these are nice aren't they. Items are also often damned cheap - a cutlery rack for 50p, a doormat for 60p, a photo frame for 85p - enough to make you wonder what Habitat are playing at. It was somewhere amid the clocks, candles and chargers that I realised that the route still hadn't gone downstairs yet, so enormously long is the meandering path on the first floor. But eventually the descending travelators appear, at the bottom of which is a section where any Londoners fortunate enough to have gardens can buy things they need. Did you remember to write down the names and locations of all the flatpack goodies you cooed over upstairs? Your STUVA, FRITIDS or LILLÅNGEN will be damned hard to find amid the extensive warren of stacked shelved boxes otherwise, and possibly too heavy to lift. By this point in my half hour safari I was so far ahead of the early morning wave that the tills were empty, but expect depressed hordes backed up through the lower aisles at the height of the weekend. How sustainable the store will be has yet to be proven, and the £35 delivery charge is probably enough to ensure anyone brings their car if they have one. But there is a 'next bus' display beside the exit, and I've worked out I could get a large brown box back to Bow by 108 with a minimum of effort were that ever necessary. I'm not convinced it will be.